Today I spent the day with our friends and their 6 week old identical twin boys. They are small and sweet and soooooo cuddly and lovable! I'm an only child but I was sure that if my parents would just send me to summer camp that I'd find my long-lost identical twin sister, circa the 1998 Parent Trap movie. 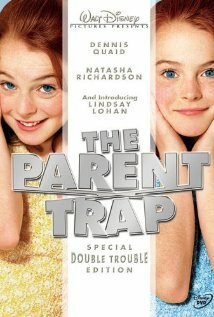 Lindsay Lohan was incredible as both Hallie and Annie. She was so fetch as Regina George in Mean Girls, and her career has been on the downhil (rapidly) ever since. She should have quit while she was ahead and moved to a small shack in the wilderness with her fame and cash back then, if you ask me! I'm so excited to let yinz know that I'm finally getting my chance to go to camp. Although not summer camp for tweens, it's Camp Blogaway for adult food bloggers! Surely I won't be finding a genetic twin, but I'll discover many new friends with at least 2 similar interests: food and writing. Bryce and I are taking a vacation to California to visit his family and, just for Memorial Day weekend, we'll go our seperate ways. He's venturing South (from his home in Southern Cali) to San Digeo while I make my way East to Camp Blogaway! Sure my experience sounds less exciting but I'll bet you that I return feeling rewarded and inspired while he returns with a headache. This is a large step outside my comfort zone, for sure, although it's fun to do something scary and exciting from time to time! Yes, moving to Hawaii 3 days after graduating college does count, too ;) I'm really looking forward to meeting other food blog authors and enjoying a weekend eating, learning, and taking in the scenery. As they say on the website, it's camp complete with hot showers, beds, food sponsors, a hot tub, and Zumba... NOT camping! When I find something that I'm interested in it doesn't take long before it becomes a full-blown obsession. 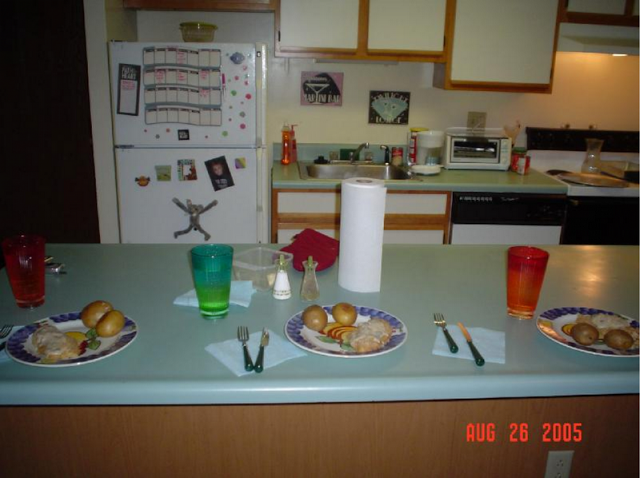 It may be a tad bit crazy but that's me and it's fun :) The photo below shows the first meal that I cooked, with the help of my Mom back in 2005. It was in my very first apartment (at Penn State, another passion of mine) and our dinner was baked chicken with Cream of Mushroom Soup and breadcrumbs and a side of baked potatoes. Everything from our plates to the salt and pepper shakers were "donated" to us from friends and family members. Living off campus meant I needed to learn to cook to survive. Once I learned enough about cooking to provide an edible meal, I started getting creative in the kitchen and taking pictures of my inventions. I toyed with the idea of creating a blog for years and finally did it as challenge myself to keep expanding my horizions with food. I've now spent countless hours in many apartment kitchens and have the kitchen appliances, gadgets, and tools of my very own to prove it. Camp Blogaway is the just next stop on this crazy ride! Look forward to meeting you at Camp =) I just started a food blog as motivation to keep me in the kitchen. Aloha Jamie! I can't wait for Camp, and to make new friends :) Your blog is great, I can't stop reading.